Seeker’s Bad Science podcast examines the efficacy of nuking a Texas-size asteroid on a collision course with Earth. An asteroid the size of Texas is plunging toward Earth, heralded by a barrage of meteors that rip the crown off the Chrysler building and smash Paris and Shanghai as well. In a desperate effort to save the planet, NASA grabs a hotshot drilling crew off an oil rig, gives them a couple of days of training as astronauts, and sends them into space to bore into the rock and blow it up, armed with a nuclear bomb and an Aerosmith power ballad. That’s how it goes down in Armageddon, the 1998 blockbuster with an all-star cast that includes Bruce Willis, Steve Buscemi, Liv Tyler, and Ben Affleck. But if we actually found ourselves on a cosmic collision course, how closely would life imitate art? 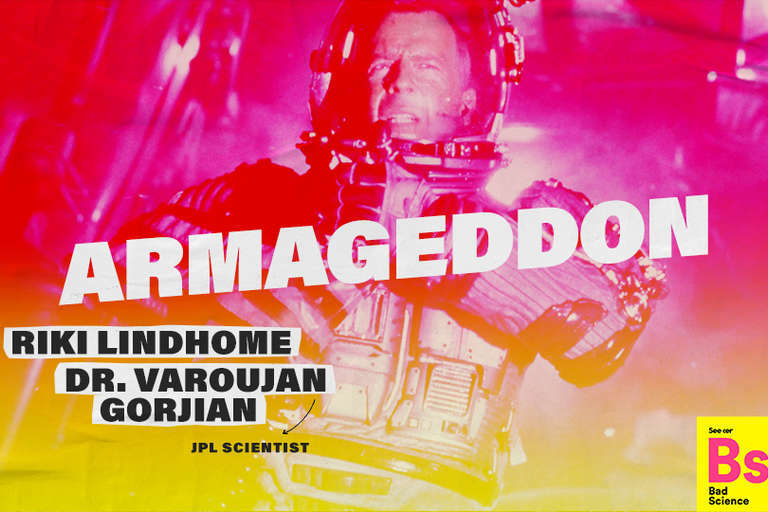 In this week’s episode of Seeker’s Bad Science podcast, host Ethan Edenburg, comedian Riki Lindhome, and guest scientist Varoujan Gorjian, an astrophysicist at NASA’s Jet Propulsion Laboratory, dig into what Armageddon got wrong — and occasionally right. First off, would nuking a giant space rock headed for Earth save us all, or just make things worse? According to NASA, which observes and tracks near-earth objects, no known asteroid or comet poses a significant risk to Earth for more than 100 years. But if a new one were to pop up on the radar, Gorjian said, using rockets to nudge it onto a different course would be a better option than blowing it up. “If you know about it earlier enough you can actually fly a rocket that hits it and has this gentle thrust and just slowly nudge it,” Gorjian said. Of course, in the movie, the killer asteroid wasn’t spotted until 18 days before impact — which Gorjian called “ridiculous.” And while the mission-control chatter and the procedure around the launches were realistic, launching two manned missions nearly simultaneously would be highly unlikely. But while the other guests lacerate the movie, Mara Tsudis — a construction engineer with experience working in oil refineries — praises its working-class hero message. “I love when normal people get to save the day,” she said. And unlike Deep Impact, the other death-from-above blockbuster that came out the same year, “Nobody was bored watching this movie,” Gorjian said. Why train oilworkers to be astronauts when you can just train astronauts to run a drill? Why risk astronauts at all? And who let Buscemi’s favorite stripper into the landing site? Hear Ethan, Riki, Varoujan, and Mara tackle those questions and more in the latest episode of Bad Science — and stick around for a duet between Riki and Ethan.